NIAGARA FALLS, N.Y. (AP) — Walking a high wire over Niagara Falls isn't only a dicey proposition, it turns out it's pretty pricey, too. Daredevil Nik Wallenda estimates his history-making, U.S.-to-Canada walk by way of a cable strung over the brink will cost about $1.2 million to $1.3 million. That includes fabrication and installation of the custom-made steel wire, permits and security on both sides of the border, travel, and marketing. A deal with ABC to televise the event live during prime time Friday will offset some of his expenses, the 33-year-old Wallenda said. "But definitely not anywhere near all of it." And the tab seems to grow by the day. "The hard part is prices have changed and gone up. There are things that can come up that are just completely unforeseen," Wallenda said by phone from Branson, Mo., where he was juggling walk preparations with production of a stage show with his high-flying family. Wallenda, who lives in Sarasota, Fla., is a seventh-generation member of the Flying Wallendas. There hasn't been much time to line up sponsors — the date of the walk was settled only about six weeks ago — so Wallenda is asking the public for donations. His video on the fundraising website Indiegogo had, by mid-day Tuesday, raised more than $15,300 toward a $50,000 goal. Wallenda plans to walk 1,800 feet across the falls at 200 feet above the gorge bottom. If successful, he will be the first to cross over the brink of the famous falls. Others have crossed over the gorge downstream but not for more than 100 years. "We need stuff like this," Wallenda says on the video. "We need things to encourage people that the impossible is actually possible." Wallenda has agreed to pay Canadian authorities $105,000 for things like extra security, crowd control, fencing and portable toilets for the estimated 100,000 spectators. He also must supply a $50,000 letter of credit, which would be used only in the event of a water rescue, said Niagara Parks Commission Chairwoman Janice Thomson. 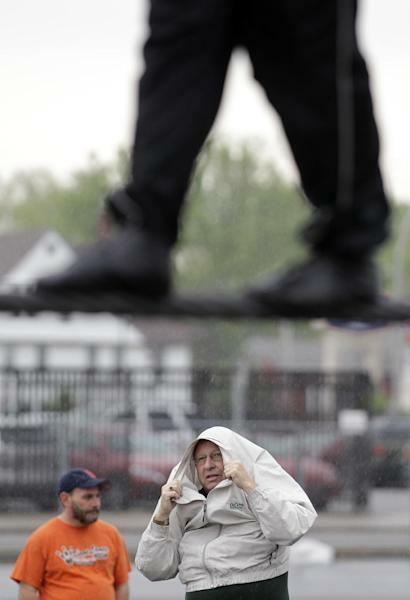 Such a rescue is more unlikely now that ABC is requiring Wallenda to be tethered to the wire. To U.S. authorities, Wallenda paid a $5,000 permit fee and will reimburse New York state $150,000 for state police and transportation services, the state Office of Parks, Recreation and Historic Preservation said. He also was asked for a $25,000 deposit to ensure he restores the Niagara Falls park to its original condition. The 7-ton cable he'll walk on will be anchored deep into bedrock a few hundred feet back from both shores and will be held by steel support structures. While the walk initially was expected to cost about $1 million, unexpected, big-ticket expenses have driven up costs, Wallenda said, including the need to fabricate two high wires instead of one. 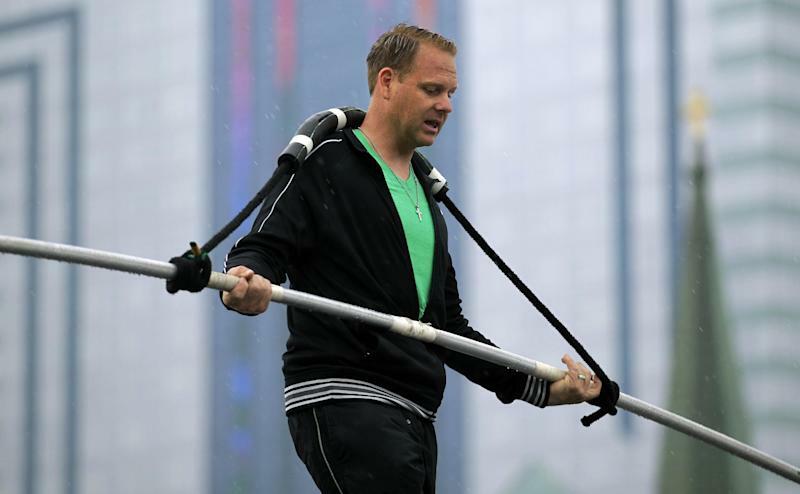 Initially, Wallenda intended to practice on the same cable he'll perform on but he couldn't find a space in Niagara Falls large enough to string it. That meant crimping the practice cable to shorten it and ordering a new one for the walk. "So that budget almost doubled," he said. Then last week, the Niagara Falls, Ontario, helicopter company he'd asked to fly a guide wire across the gorge, so that the actual cable can be pulled across, discovered it didn't have the necessary Federal Aviation Administration permits for such an operation and Wallenda had to scramble to find a replacement company, in Pennsylvania. "You have to get a helicopter company last minute, that hurts," Wallenda said. "There are things like that that come up that are completely unforeseen ... $50,000, $100,000. These are big, big line items." 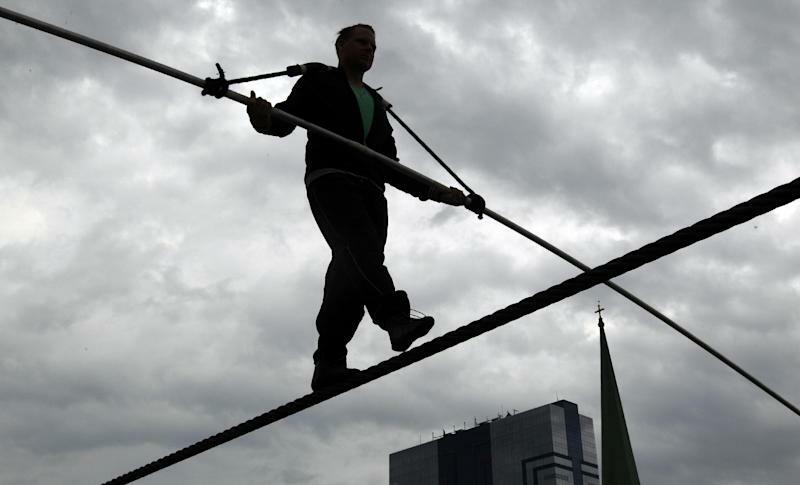 Although the walk will be broadcast live on ABC, Wallenda said legal liability considerations prevent the network from specifically funding his preparations, materials and all the others costs that go his act. He's hoping thank-you gifts for donors will push the Indiegogo numbers up. For $5, donors get a picture from the walk, for $10, an autographed poster. As of mid-day Tuesday, one person had pledged $5,000 for access to a VIP viewing area and dinner with Wallenda. There were no immediate takers for a private Wallenda-taught backyard wirewalking lesson, dinner and VIP viewing, for $10,000.